In this bay, Te Wahapu, a trading post and ship repair yard were established by Gilbert Mair in 1831, and run by him with William Powditch as a partner in the early years. Mair’s house stood on the point, beside the Norfolk Islands pine planted by Mrs Mair about 1836. From 1840 the station was operated by American leasees, two of whom, William Mayhew and Henry Green Smith, also served as vice-consuls. It was occupied by British forces on July 20, 1846, and garrisoned by the 58th and 65th regiments until December 1857. In 1999 concerns were held for the tree’s survival as erosion cut away at the bank below, exposing many of its roots. However the tree still flourishes, as does the one in the Waitangi Treaty grounds, which is the same age and from the same source. Mrs Mair planted one seedling and gave the other to Mr and Mrs Busby, a hundred and seventy two years ago. The Waitangi tree is a classic specimen though, with only one trunk. 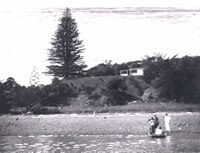 The photo shows the Te Wahapu tree and reserve area in the 1940s.